One of scores of barred owls you can find pictured online. The federal government has started killing barred owls in northern spotted owl territory, carrying out a plan that has been in the works for several years. But while it’s hard to argue against this owl campaign based on logic, it still seems like a bad idea. 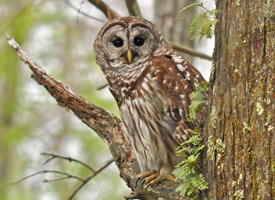 When the Fish and Wildlife Service said Friday that its biologists had shotgunned 26 barred owls near Arcata, Calif., the story made the news nationwide. Why the fuss? We kill animals by the thousands every day. Some we eat. Others we kill for sport and then eat. And some we kill by accident on the road. Maybe we should make a fuss about that, especially the practices in the meat industry, but we don’t. What makes killing owls noteworthy? It’s the motive. The Wildlife Service plans to shoot 3,600 barred owls — also known as hoot owls — over six years to see if this helps stop the continuing decline of the northern spotted owl, a threatened subspecies in the woods of Washington, Oregon and Northern California. The government plans to keep a number of nesting sites free from barred owls, hoping their spotted cousins will come back. Evidently saving the remaining habitat of the spotted owl has not been enough to do the trick. Saving habitat for wildlife is one thing, a sensible move in the minds of most people. But eliminating the competition from other animals in nature is something else. The barred owl is bigger than the spotted kind, but otherwise both look similar. The two are closely related, and according to the West Sound Wildlife Center in Bainbridge Island, Wash., hybrids of the two species have been found. So why not leave these birds to their own devices instead of spending $3.5 million on this experiment in wildlife management? I agree with you and the petitioners. What part of evolution do the policy makers and agencies not understand? P.S. Thanks for the simple math.